In November of 1957, the Sodium Reactor Experiment (SRE) came online. In a PR effort by the Atomic Energy Commission, Edward R. Murrow’s “See It Now” television show was present to film when the SRE was tied into an Edison substation to light the town of Moorpark. Supposedly, this was the first time a nuclear reactor produced commercial electricity. CBG commemorated the 50th anniversary of the SRE’s partial meltdown with a discussion of the incident, historical documents, as well as historical images and video. 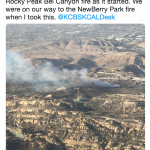 Click here for more information, including CBG’s image, video, and document archive regarding the infamous partial meltdown. 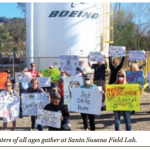 After disclosures by CBG that DOE had altered critical numbers in a key table related to the cleanup of the contaminated Santa Susana Field Laboratory, EPA insisted that it take the lead on an independent radiation survey, and after years of resisting, DOE has finally agreed. See CBG disclosure, EPA letter, DOE response, and NRDC-CBG letter. 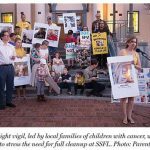 For years, the community surrounding the contaminated Santa Susana Field Laboratory had been promised that US EPA would conduct a comprehensive, independent radiation survey to locate the contamination that needed to be cleaned up. More . . .
A presentation about substantial contamination of groundwater and surface water at SSFL.